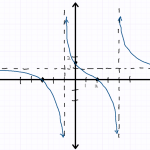 Here is a summary of all of the tutorials about rational functions on this site. Struggling with rational functions? These posts should help point you in the right direction! If you’ve got a question about rational functions that I haven’t addressed below, please leave me a comment and I’ll do my best to add the content you request! functions, make sure that you have a solid understanding of polynomials. Once you’ve mastered polynomials, start with the basics of rational functions. Learn about what a rational functions are, how to find the roots, the y-intercept, and the domain. Also learn how to create a sign pattern and use it to solve inequalities! Now that you’ve got the algebra of rational functions figured out, it’s time to dive into graphing. 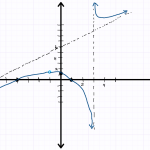 Click here to learn how to put together x- and y-intercepts, vertical asymptotes, horizontal asymptotes, and sign patterns to make great graphs of rational functions. Ready to step it up? Learn about how to handle holes in your graph, and what to do if your horizontal asymptote turns out to be slanted. Are there any rational function topics I forgot to include? Please let me know by leaving a comment below! I’ll do my best to add posts for any topics you think are missing!